Before removing load bearing wall there must be a beam that needs to be designed to carry all the loads that the wall carries. This beam has to be on site ready to install before removing walls. 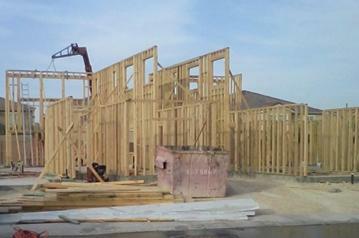 Like framing a house materials for framing walls to temporarily support the floor or roof load while the wall is being demolished are also needed. 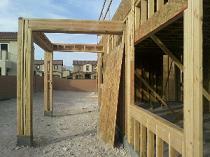 These materials are typical for framing a wall such as wood studs, top and bottom plates, and extra for lateral braces. If the wall is a shear wall, care must be taken to ensure the leftover wall and anchor bolts are not damaged. Prior to demolishing the wall, the temporary wall must be installed first. 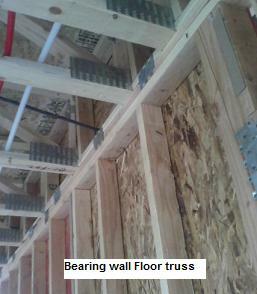 The top plate of the temporary wall must be nailed directly to the floor or roof joists. This means that any drywall or ceiling material must be removed to expose the joists. This is done to avoid the weight of the floor or roof crushing the non-structural drywall or ceiling causing the floor to drop. The temporary wall must not be more than 4 feet from the wall to be demolished to allow working area but not too far that cause structural damage to the cantilevered floor joists. The cantilever will be created when the wall is removed leaving the distance from the temp wall to the new beam hanging. If the floor joists that are framing into the bearing wall to be removed come from both sides, two temporary walls are required, one on either side of the wall. As precaution any heavy items on the floor such as equipment, furniture, water bed, etc should be moved away from the area to lessen the load on the cantilevered floor joists. Once the temporary wall(s) are installed its time to start removing the load bearing wall. Begin removal with the studs and then top and bottom plates. Before installing the beam make sure any nails is removed.